The humble keyboard has risen in popularity in recent years; the seemingly infinite variety of models has turned the input accessory into something like watches for people with Newegg accounts. With companies trying to cater to every preference and price point, maybe it was inevitable that we’d end up with something like Roccat’s new Horde AIMO. It’s a $100 keyboard with an assortment of multimedia features and an uncommon “membranical” design that attempts to answer a series of seemingly contradictory questions. Is it possible to make a quiet typing experience without sacrificing the feel of obnoxious clackity-noise-making keyboards? Can we incorporate some much-needed features into a relatively inexpensive package? Can we make it look like it doesn’t belong in a college dorm and give it RGB backlighting? Maybe! A keyboard that uses a membranical typing mechanism, a mix of membrane and mechanical keyboard features. 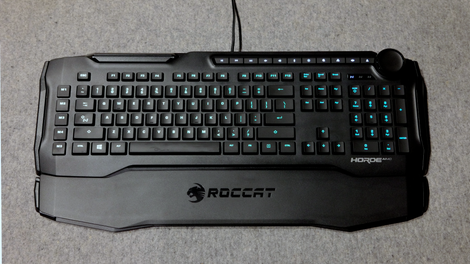 It's got an integrated control dial, RGB backlighting, and a great sound when typing. 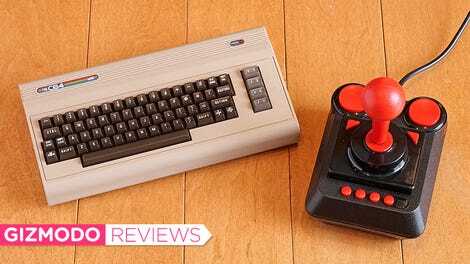 It feels a bit cheap, and isn't quite as responsive as a traditional mechanical keyboard. At its most basic level, what makes this keyboard special is its hybrid “membranical” design. If you’re not familiar with keyboard technology, here’s a quick rundown: Membrane keyboards (like the keyboard that shipped with your iMac) are cheap, made of a rubbery layer placed atop a circuit board. Pressing a key depresses the membrane, which closes the underlying circuit and transmits your keystroke. You can probably recognize a membrane keyboard by how “squishy” the keys feel, or how hard you have to press them. Mechanical keyboards offer a much more forgiving typing experience. They’re made with plastic and metal components—called a switch—that last longer, require less force (depending on the switch). These keyboards are preferred by people who want a more responsive experience when typing, or need to guarantee a keystroke is registered during fast-paced games where every second counts. Basically, they are for nerds and typing enthusiasts. The idea of the Horde AIMO is to combine both of these, using a membrane layer to prevent popcorn detritus and dust from rendering it inoperable, and adding a more tactile mechanical element to simulate the premium mechanical keyboard experience. In theory, you should get that action you expect from a mechanical keyboard paired with a quieter typing experience. It’s not the only membranical keyboard around (Topre makes the gold standard), but compared to available options like the $100 Razer Ornata, which lacks some major features found on the Horde AIMO, it’s in line with the competition from a pricing perspective. As it happens, I’m a big fan of keyboards, and use a Logitech G710+ with Cherry Brown switches. They’re the middle-ground in the mechanical keyboard world: quiet enough to not annoy office workers, easy to use without much force (perfect for blog screeds), and quick enough to feel satisfying when I smash ‘em during devastating FTL runs. The multimedia functions (controlled with the integrated dial) are a time-saver when it comes to quick customization. Compared to my G710+, the Horde AIMO does feel like a keyboard I wouldn’t mind using, especially when gaming. And if you haven’t been spoiled by the allure of a mechanical keyboard, it’s definitely better than that stock one you’ve got in front of you. Still, the keys on my G710+ bounce back quickly, and offer slight resistance compared to the Horde AIMO’s more nebulous keystrokes, which occasionally prompts my fingers to press just a tad harder on the keys after passing the actuation point. The membrane layer is no doubt to blame for the slightly less springy quality feel, but it’s a lot quieter than my mechanical keyboard And I love that staccato sound it makes when I’m really hammering away. The keys, lower in profile compared to mechanical keys, are slightly indented, and have a nice soft finish I predict will wear away within a year’s time. I’m a big fan of the column of the five customizable half-height macro keys on the leftmost end of the keyboard, probably because I’ve accidentally hit the normal-height macro keys on my G710+ so many times I’ve lost count. Half-height macro keys for faster response time? Sign me up. Yet the Roccat Horde AIMO’s looks don’t do it any favors. It has a designed-by-committee aesthetic, like someone opened Photoshop and blended pictures of a keyboard at a public library with one from an e-sports tournament. There are sharp points on its front, soft slopes around some keys, indents on the sides, and a weird asymmetrical slot cut-out seemingly for a 3x5 photo of your loving family (the cut-out is too wide for any photo). The detachable plastic palm rest, emblazoned with the Roccat logo (some sort of Blade Runner-inspired typeface next to a cat) is flimsy. 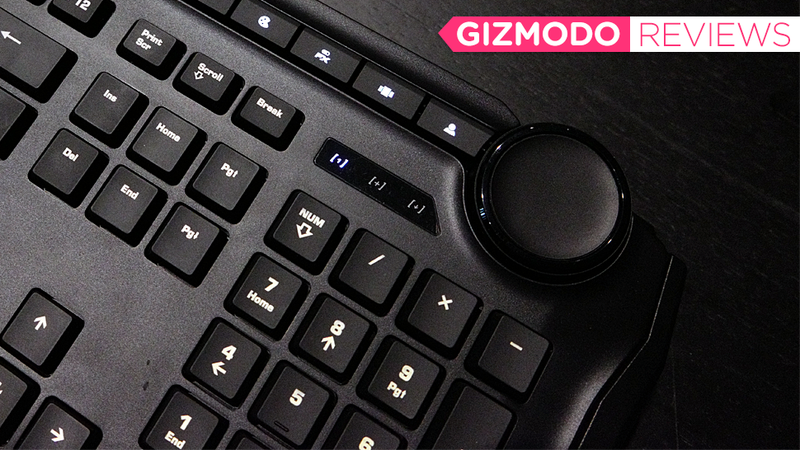 Like all plastic palm rests, and makes it look more like a gaming keyboard than is necessary. The dial is pretty great, but I wish you could depress it for just one more click. Also, this design leaves much to be desired. It’s got an all-black, plastic construction, with white characters that allow the weak RGB lighting to dimly poke through in well-lit rooms. There’s no additional USB port either, meaning I can’t connect the dongle of my wireless mouse to it like I do with my current keyboard, nor can I charge it. On the plus side, the integrated 20-step dial (it rotates 360 degrees) is a real delight, and supports the same apps as Microsoft’s $100 Surface Dial. Still, it’s missing a much-needed click option. To the left of it is a set of predefined options for quick adjustments to speaker volume, microphone sensitivity, LED color, lighting pattern, app selection, and a user-defined option you can adjust in Roccat’s Swarm app. Roccat’s Swarm software needs a serious bug fixing session. Speaking of which, the Swarm app, meant to manage Roccat’s suite of accessories and provide user customization options, is bad. On my Dell desktop, I had to reinstall the app twice to get it to work. It also needs to improve its support on high-resolution monitors, as the text and interface was downright tiny when viewed on a 4K display. Roccat’s Horde AIMO keyboard straddles both sides of the fence, providing a more than adequate typing experience along with some multimedia and gaming features perfect for someone who’s not ready to go all-in on a stark mechanical model or some gaudy and tricked out membrane keyboard. No, you’re not getting the best of anything here, but you’re getting something that just scrapes past the cost of admission, at least until you’re ready to upgrade. Keyboard sounds lovely, feels responsive enough for most uses. Easy switching between Dial wheel settings. Dial wheel integration is perfect for designers, but imperfect. Boring aesthetic doesn’t do it any favors. Software needs some serious bugfixes.